If we can't unravel the demon's sinister motivations, more innocent people will die, but finding the answers means digging into dark secrets...and learning truths I never wanted to know. 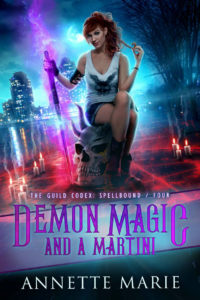 Demon Magic and a Martini is the fourth book in Annette Marie’s Guild Codex: Spellbound series and wanderers, I am still so hooked on this world and these characters! Overall Demon Magic and a Martini was another great, fast paced, witty adventure. It was fun to experience this new magic but also peel away more layers of our main characters. If you are not familiar with Annette Marie, she writes really cool urban fantasy worlds that I highly recommend. Recommended for fans of: The Southern Vampire series, paranormal romance, urban fantasy, snarky heroines, loyal friendships and so much sass.